Yesterday Apple announced some of the new features that the iPhone OS 4 is going to pack and naturally, everyone's attention was focused on the multitasking capabilities and advertising with iAds. However, the new OS version will also bring a set of less significant improvements and one of them is Spotlight - the enhanced universal search. Spotlight searching can now be performed on the Internet or Wikipedia, rather than in the phone memory alone. What an innovation! How brilliant, wonderful, amazing... In fact, universal search in webOS and Android (after Donut) is functioning the same way, and Windows Phone 7 is also going to offer similar functionality. 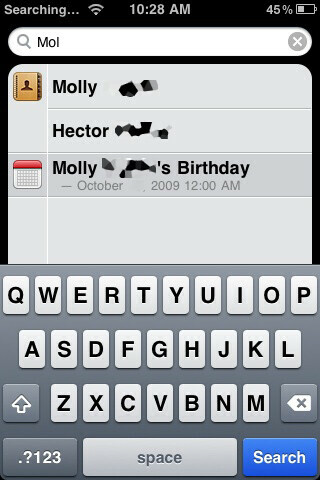 It is still good that Apple decided to implement this element into iPhone OS 4. Better late than never, right? Wow sarcasm from phone arena regarding an apple product? Lol. Bout time.